This morning I woke up with my ankle still swollen and twingy. I knew I needed to get it professionally looked at. Athlete's Care is close to where I work so when I arrived at work the first thing I did was give them a call. The best they could do was get me in on January 15th, eight days from now! Despite the fact I am a client of theirs and this is an injury not a check-up, I was appalled. I was told that booking two weeks ahead is their policy. That is OK if I could plan when I am going to be injured but hey, this is real life. So I called East Liberty Medical Centre and booked an appointment with Lauren, who has done a great job looking after me so good in past. She could see me at 3:30. Much better! She gave me her usual thorough exam. The good news is there does not seem to be any ligament tears. It seems I have just a Grade 1 sprain (Grade I is an injury without macroscopic tears. No mechanical instability is noted. Pain and tenderness is minimal). Lauren pointed out that this was an inversion injury, as my ankle tuned inward under my body as I fell over stretching my anterior talofibular ligament (ATFL). 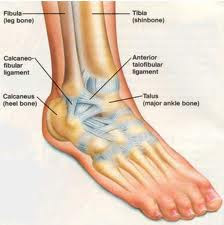 This is the most common kind of ankle sprain and likely will take six weeks or more to heal. I am to keep it rested, elevated whenever possible and iced. That will be tough during the day at work. She also said I should buy a cane, not only to take the weight off of my left ankle when I walk but also to prevent injuring my right knee, due to walking funny to compensate for my injury and putting undue pressure on that knee. No exercises yet but she told me of a treatment I am to do that I have never heard of before. First get two buckets. In one is water with ice cubes. In the other the water is hot but very bearable. I place my injured ankle in the cold water for 10 seconds, then into the hot water for 20 seconds. I repeat this for 10 minutes. Should be interesting. Next appointment is Wednesday. I'm glad I decided to go with professional treatment! Hey! How do you like my new cane! It helps keep the feet in good position so you're not stressing one part of your foot more than another.